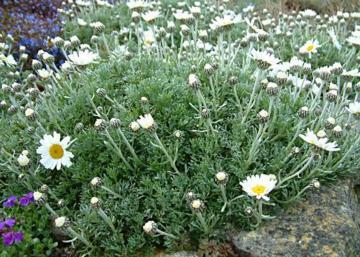 Densely bushy, spreading, sub-shrub with softly hairy, deeply lobed, silvery grey-green leaves. 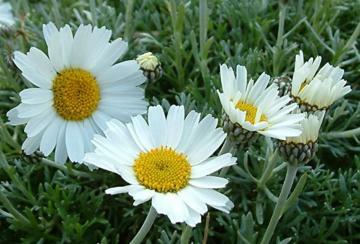 Daisy-like white flowerheads with yellow centres, on short stems, produced over a very long period from early spring to autumn. The flowerheads are surrounded by silvery bracts with distinctive black margins. Very well drained soil in full sun. Hardy but dislikes winter wet. Dead-head to promote extended flowering. From seed or softwood cuttings in early summer. Suitable for a rock garden or alpine house. Native of the Atlas Mountains in Morocco.